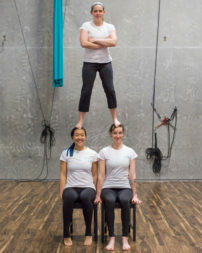 Alexandra Pearson, Jennifer Yan and Catherine (Katie) Cresswell are the founders of Triumph Acrobatic Arts Ltd., a circus school in Mission, BC. They chose Mission as it did not have anything quite like it in its city borders. Q. What has your WEC loan enabled you to do in your business? A. Our WEC loan has allowed us to install aerial rigging points and build a dance floor. Our aerial classes are the most popular and the dance floor keeps our participants’ bodies safer. It has really rounded out our gym and made it look and feel like a circus school. Q. What inspired you to take the leap and start your own business? A. Katie, our company president, had always dreamed about starting her own circus school. She reached out to Alex who reached out to Jen and it went on from there! Having worked at different studios and gyms, we knew what we liked and what we didn’t like, and wanted to take it on ourselves. Q. What’s the biggest lesson you learned when starting your business? A. Communication, thoroughness and work ethic are keys to growing a business. Also, stay on top of the paperwork! Q. What is your greatest strength as an entrepreneur? A. As a group of 3, our greatest strength has to be communication. Additionally, knowing each person’s strength has meant being able to excel in all aspects of our business. Q. What are your goals for the business? 1. To continue to foster the growth of our wonderful circus community and help the kids in our school to thrive in all aspects of their lives. 2. To fill up our classes with people who enjoy moving and want to have loads of fun! 3. To create a work environment where the staff are excited to come to work and feel as though they are making a valuable contribution to the community.